You can also use the MARINE DEBRIS REPORT FORM. Please activate the locator on your phone before taking any pictures and attaching them to your report. The additional data contained in your photo will assist us in locating the debris and help to accelerate the removal process. More marine debris washes up on some beaches than others due to local current patterns. Kamilo Beach, Island of Hawai`i, is such a place, presenting a constant challenge to local community groups who strive to keep it clean. Photo used with permission courtesy of Algalita Marine Research Institute. Marine debris consists of man-made objects cast adrift in the ocean, either washed into the water from land-based sources or discarded from vessels at sea. In Hawai`i, marine debris drifts into our waters and comes ashore all year, every year, and, unfortunately, there has been marine debris in our oceans for as long as there have been people to create it with no end in sight. Marine debris of any size poses a threat to the health and safety of the human population as well as birds, all marine species, and the fringing coral reef that protects our shorelines from erosion. The March 11, 2011 Tohoku earthquake and resulting tsunami that devastated Japan was a human tragedy of epic proportions. The disaster claimed nearly 16,000 lives, injured 6,000, and destroyed or damaged countless buildings, homes, land-based vehicles and sea-going vessels as well as coastal infrastructure, much of which was swept into the sea by retreating tsunami waves. 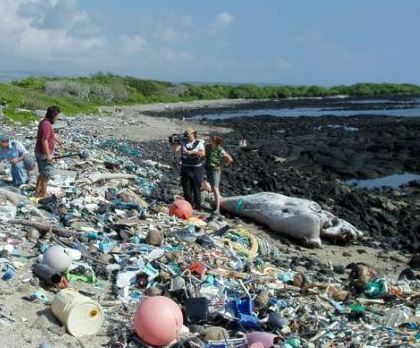 The Japan Ministry of the Environment estimates that five million tons of debris washed into the ocean (not the 25 million tons according to initial estimates) as a result of the disaster. They further estimate that 70 percent of the debris sank offshore near the coast of Japan soon after the event, with the remainder swept away by currents into the North Pacific Ocean. We have already heard reports and seen pictures of identifiable Japan tsunami marine debris (JTMD) items that made landfall on the Pacific shores of Alaska, British Columbia, Washington, and Oregon since 2011. 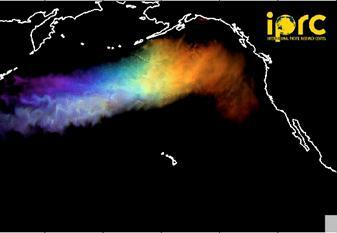 Oceanic current models and estimates completed by scientists at the U.S. National Oceanic and Atmospheric Administration (NOAA) and the University of Hawai`i forecasted that some high-floating debris from the Japan tsunami may have passed near or would wash ashore on the Main and Northwestern Hawaiian Islands sometime in the Summer or Fall of 2012. Indeed, the first confirmed item of JTMD was recovered on September 18, 2012 off Makapu`u, Oahu, and other unusual items, yet to be identified but suspected to be from the Japan tsunami, have also been spotted in other places in the islands since then. NOAA expects more JTMD items to show up intermittently along shorelines of the entire Hawaiian Archipelago over the next few years, or longer. Another event following the Japan tsunami of March 11, 2011, was the failure of a nuclear power plant in Fukushima Prefecture, raising public concern about the possibility of radioactivity in marine debris in general. We have been assured by professionals at the Department of Health that it is highly unlikely to find any hazardous radioactive debris in Hawai`i since most tsunami debris was washed out to sea well before the release of radioactive materials from the Fukushima power plant and due to extended exposure and weathering by the elements of any items that may have been affected by surface fallout. To date, radiation testing of marine debris collected along shorelines on the West Coast of the United States and Alaska, including debris confirmed to be from the tsunami, have all shown readings to be within normal or background levels. The State of Hawai`i Department of Health (DOH) has been regularly monitoring Hawai`i’s shorelines for radioactivity since April 2011, and has found nothing above normal background levels. For more information, DOH maintains a website with information about these activities at http://health.hawaii.gov/about/current-public-health-concerns-related-to-japan/. The threat of aquatic invasive species (AIS) is a constant concern on both land and sea. Materials placed into the ocean for a long period of time will often acquire some sort of biofouling, or growth of marine organisms. For items that wash into the ocean from land and then are colonized by common open ocean (pelagic) species such as gooseneck barnacles, these are not a concern should they drift into Hawaiian waters. However, marine debris arriving in Hawai`i that had already acquired local biofouling at its point of origin before being cast adrift in the ocean is of great concern. The threat of alien species being introduced to Hawai`i is no small thing. Alien species, once introduced, can become established and threaten native ecosystems, and even drive native species to extinction. Therefore, if marine debris with biofouling is found, it should be reported as soon as possible to DLNR so that a biologist specializing in AIS identification can inspect and, if necessary, dispose of the organisms. For an informational flyer on aquatic invasive species and Japan tsunami marine debris visit http://files.hawaii.gov/dlnr/dobor/DLNR_MD/pdf/AIS030613.pdf. Whereas some debris items with identifying markers can be traced to their source, many cannot, and most marine debris have no markings at all, so their origins remain unknown. Much of the debris we see drifting in Hawaiian waters or landing on our shores may have been in the ocean long before the Japan tsunami, may originate from other countries besides Japan, or even have been locally generated from our own State. 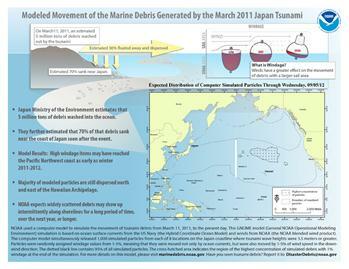 However, if found debris is suspected to be from the 2011 Japan tsunami, please let us know. Email a photo and location description with your contact information to dlnr.marine.debris@hawaii.gov or DisasterDebris@noaa.gov. You can also call 808-587-0400 to make a report. We greatly appreciate the efforts of those who volunteer their help by disposing of small unidentifiable items and reporting unusual, large, or hazardous items, however, we encourage all to use safe practices, take proper precautions, and, when in doubt, stay away from items that may be unsafe. Guidelines for volunteers can be found at NOAA’s Marine Debris Program website at http://marinedebris.noaa.gov/tsunamidebris/debris_handling.html. DLNR will work with the DOH and partners on advisement if anything hazardous is reported. A Hazardous Marine Debris Handbook was originally written in Japanese to advise beach users of potentially hazardous marine debris items. It was translated into English by the Government of Japan in order to advise beach goers and cleanup personnel in the U.S. and Canada of potentially hazardous items that may be arriving from Japan, after the tragic tsunami event of March 11, 2011. Do not touch or attempt to move an item that is potentially hazardous. Call 911 immediately. If it is a filled oil drum, oil spill or potential chemical spill report it to the National Response Center online at www.nrc.uscg.mil or call 1-800-424-8802. Give authorities a detailed report about what you have observed. When safe, report the item to DLNR and NOAA at dlnr.marine.debris@hawaii.gov or DisasterDebris@noaa.gov. DLNR is particularly concerned about any large or hazardous marine debris that may drift into State waters or come aground on Hawaiian reefs and shorelines. For these items please call (808) 587-0400 to report a detailed description (including approximate size), whether there are any attached marine organisms, date found, detailed location information, and finder’s contact information. If pictures can be taken to aid in identification, they should be e-mailed directly to dlnr.marine.debris@hawaii.gov andDisasterDebris@noaa.gov.